Walls and the Tiger has received the Amnesty International Award for best film about human rights at the seventh “Tutti nello stesso piatto” Film Festival in Trento, Italy. The award ceremony took place in Trento on 26 November. 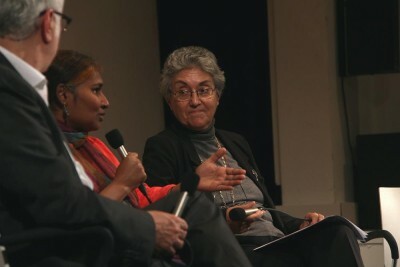 In the Amnesty International Jury were: Beatrice De Blasi, festival artistic director; Maria Rosa Mura, founder of the Association ‘Gioco degli Specchi. Migranti Cultura Società’; Alessandra Ballerini, human rights and immigration lawyer; Marco Pertile, International Law professor at the Università di Trento and Graduate Institute di Ginevra; Federica Maggiolini, vice-president AIESEC Italia; Giacomo Bertollo, student and AIESEC Italia member; Maria Cadonna, biologist and Amnesty International activist in Trento; Alberto Lavelli, FBK researcher and Amnesty International activist in Trento; and Riccardo Noury, Amnesty International Italia spokesperson. After several years of planning, filming, and editing Walls and the Tiger, we’ve begun to present it at a variety of venues. In addition to showing it to friends and colleagues in the US, India, and Australia, we’ve had public presentations in various European cities at some important venues and events. In March, Walls and the Tiger was featured at a convention of the European Environmental Bureau, one of the union’s largest such organizations. In April, Walls and the Tiger was the feature presentation at Ciné-ONU, an always well-attended showcase of documentary films that bear on UN themes. Launched in 2007, it is run by the UN’s Regional Information Center (UNRIC), in Brussels, Belgium. Earlier this week, 2 June 2015, the documentary film was very well received by a packed house in Helsinki, Finland, at the Andorra theatre. Our host for that evening was United Nations Nordic. We were particularly proud to tell the story of Indian farmers’ struggles at that cinema, as it was founded by legendary Finnish filmmakers Aki and Mika Kaurismäki. And we heard at that presentation that a screening of Walls and the Tiger may soon take place at the UN-NYC — we’ll keep you posted, on that. Later today, 4 June 20, a presentation is scheduled for Lisbon. Ciné-ONU will screen the film at Cinema São Jorge. Ciné-ONU hasn’t screened films in Portugal in a while, but based on the response Walls and the Tiger got in Brussels, it is reintroducing screenings with Muros e o Tigre. Sushma and Liam are there, as they were in Helsinki, introducing the film and responding to the many questions that audience members have, including: How can other bookers have Sushma and Liam come to their city, and present Walls and the Tiger, there? The answer to that is simple: It can happen if we can raise a little money, to do that. Meanwhile, please do contribute, if you can – if not financially, then we’re always very grateful to receive leads, tips, and suggestions, too. 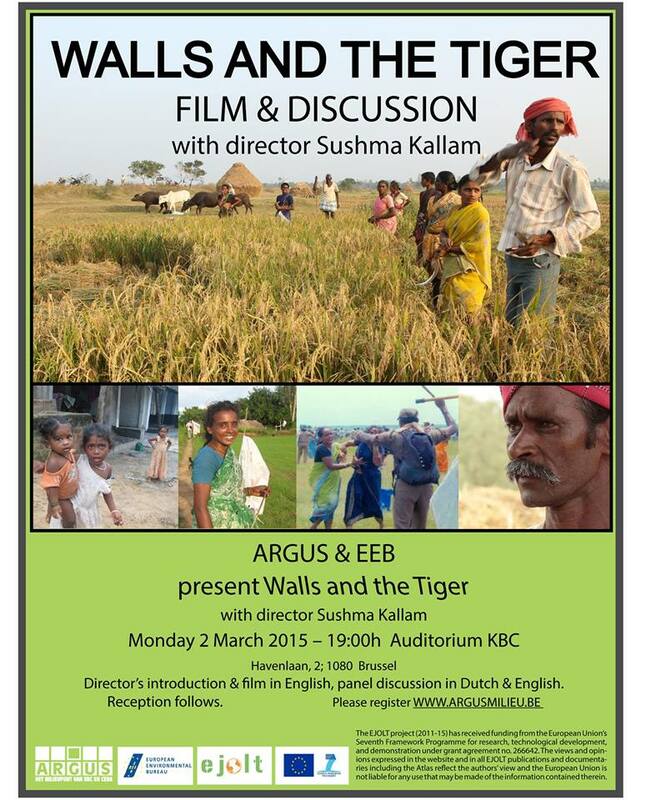 We are honored to have presented Walls and the Tiger at the European Environmental Bureau’s EJOLT conference on Environmental Justice, 2-3 March 2015. Walls and the Tiger was shown as a featured evening event, with a debate following, as part of events marking the completion of a four-year EEB project involving 100 people in 30 countries: the international project on Environmental Justice Organisations, Liabilities and Trade (EJOLT which has mapped and documented hot spots of environmental damage of many kinds, and addressed legal avenues for communities seeking environmental justice. At the event, participants and policy experts considered how and where the knowledge from EJOLT can be used.